When is it time to start wearing a wig for hair loss? When clients ask “when is it time to wear a wig?” if they are getting ready to undergo chemotherapy, have suffered androgenic hair loss (thinning) of the hair for years or decades or are losing patches to alopecia areata, the answer varies. A better question though is when to begin shopping for a wig, and that answer is nearly universal: while you still have hair, sooner, rather than later. While you still have hair, your wig stylist can see your current hair and style, ask you what you like about your hair, what you wish your hair could be, and explore your lifestyle. Wearing wigs, or wearing hair as many wig wearers like to call it, is a personal decision, but making the choice to wear one is better when you do have hair. 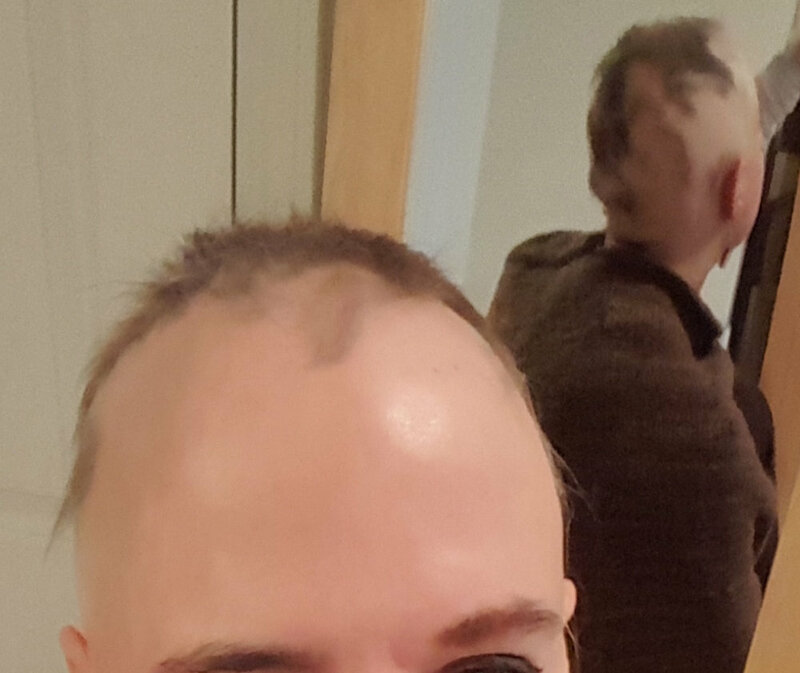 This is an actual A Wig and Prayer client, about six weeks after an onset of Alopecia Areata. The average time for a custom human hair wig is 8-12 weeks. We sourced her a temporary synthetic wig (which took 10 days). She had already lost enough hair within the 10 days, that she had to resort to hats and scarves. Planning ahead is important. Come in before you think you need to. If you opt for a full wig in a human hair wig, you may have to wait 6-12 weeks for your hair to be ready, so you don’t want to make the decision to wear a wig at the last minute. You can get a temporary synthetic wig from your wig salon (and it can arrive in the salon in Okemos) that will be an inexpensive option to get you through til your beautiful new hair arrives and is styled. If you’re getting a good quality synthetic wig, and it’s in stock, you will usually wait 7-10 days for the synthetic wig to arrive in the wig salon in Okemos, and a few days further to schedule your try-on session. From there, you’ll have your wig trimmed and styled to fit you. Many wigs need trimming/thinning to look like the you that you love. For those with androgenic alopecia, when your hair has gotten thin enough or your hairline has receded enough to not look how you love, that’s the time to get a wig. You might have better perspective looking at older photos compared to recent photos. We get used to the slow progression of how we look, so you might not notice just how thin your hair has become. For alopecia areata, where the hair falls out in patches, progression of the disease can be months or days long, so don’t wait. Come in while you have enough hair that you won’t have to wear a temporary wig while yours is on order. If you are undergoing chemo, usually between 1-4 treatments, you will begin losing hair. Some lose it fast, others slower, but when it falls, it comes out in clumps and you’ll be staring at patches of bald scalp. It’s best to select your wig when you still have hair, so come in as soon as you know you’ll be undergoing treatment. The answer whether you should wear a wig is entirely personal. But when you should select your wig is always sooner rather than later. Since that first visit to your wig salon can be an emotional event, learn more about what you can expect here before you go. And schedule the appointment. It may be a hard step, but no one has ever left a wig salon without looking (and feeling) amazing! You will say "why didn't I do this sooner!"